One of the nice features of bird guides on mobile devices, compared to their traditional paper counterparts, is the ability to only show birds you might see in a state (apart from the occasional rarity that has strayed far from its normal course). I used this feature when researching the places we considered moving, to see how many of the birds will be new to me and how many I’m going to have to say goodbye to. Some will at once be familiar and unfamiliar, such as this song sparrow singing from the cattails at Ridgefield’s South Quigley Lake, as while the ubiquitous sparrow does live in Arizona it has a different look from the those of the Pacific Northwest. This is part of the attraction of the desert for us, it’s a big change from what we are used to, and my hunch is I’ll have fun exploring the landscapes and wildlife there for many years to come. We’ll see if time proves me correct, but I’m optimistic. I am going to miss in particular the auto tour at Ridgefield though, this is by far the place I’ve spent the most time in the Northwest, as well as the wetlands in general. 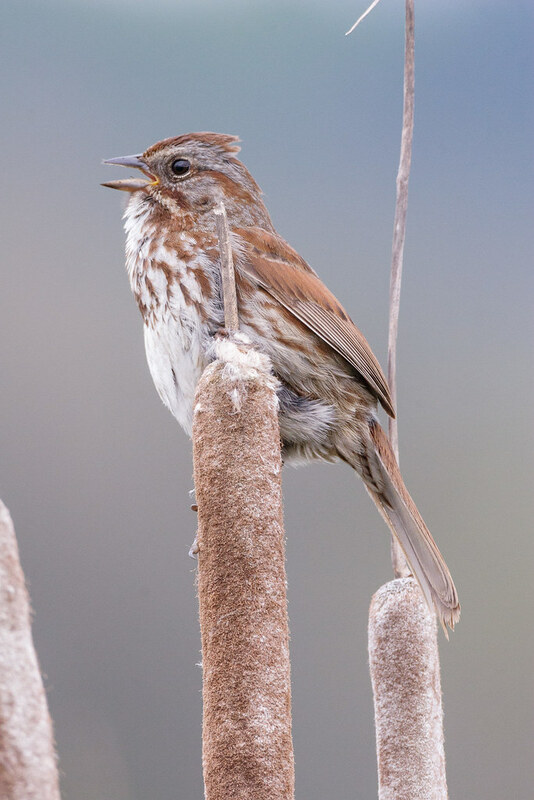 This entry was posted in Birds and tagged auto tour, cattail, perching, Ridgefield National Wildlife Refuge, River S Unit, singing, song sparrow, South Quigley Lake, Washington. Bookmark the permalink.